Respond to chats right from Slack, We want to enable you to talk to your customers from anywhere at any time. We know it’s hard to be in front of a computer at all times and a lot of you spend most of your day in Slack. That’s why we built our two-way Slack integration. It’s free to use Acquire + Slack. 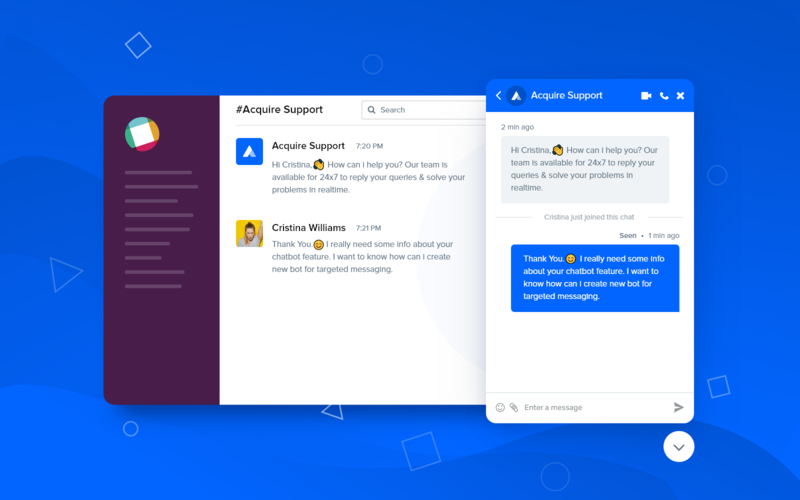 Whether it’s a prospect on a website that has a question or one of your customers that are stuck and are looking for product information, the customer support agent will be able to give response/answers to the visitors in real-time right from slack. As you can see, Acquire automatically creates a brand new channel for that conversation (#acquire-chat-12345) in the above example. You can then click on the link to create the new channel, and respond directly to the customer. Once you type your message and hit send button, the visitor or user will be able to see that message pop up in their Acquire chat. Go to https://app.acquire.io Dashboard > Setting > Integration > Click On Slack. You’ll be redirected to Slack where you’ll need to log in for authentication. 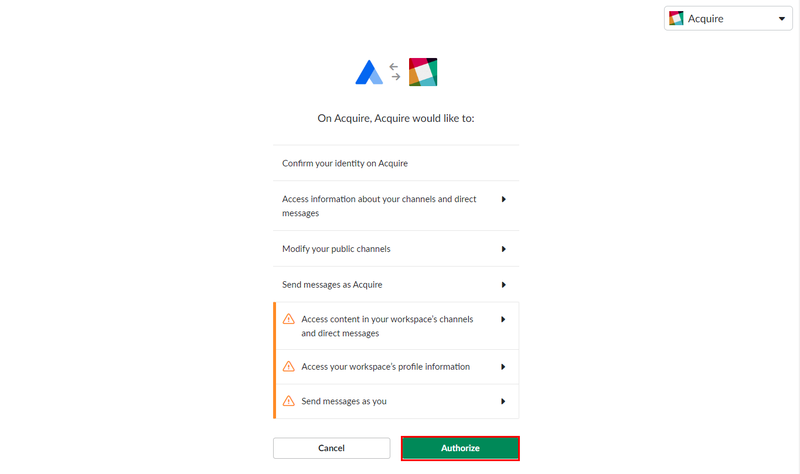 Once logged in, click Authorize to grant access to Acquire to send messages to Slack. You can select any of the channels from the list or pick a new channel when a visitor starts a chat. The message will get displayed under the selected channel. 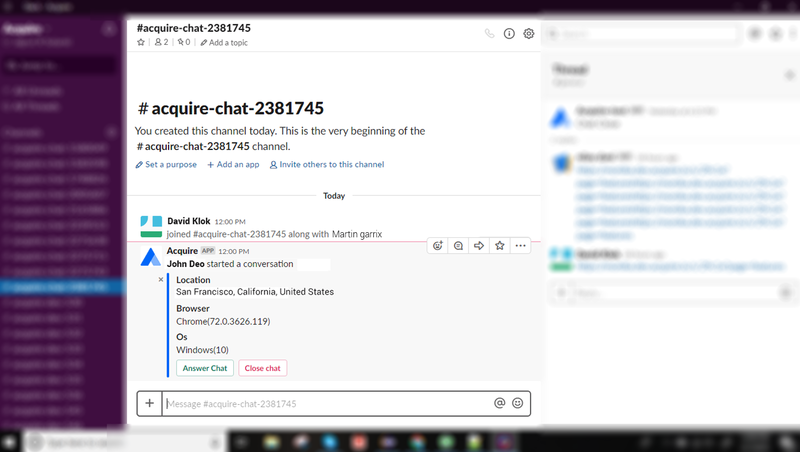 After the integration, whenever the visitor/customer messages from Acquire chat widget, slack will get notify on that selected channel, if he has selected new channel then it will create a new channel like #acquire-chat-2381745 as shown in an image. All team members will receive a new channel notification. They can also join the chat to solve the customer queries on a priority basis. After pick Answer chat button, all customers’ unseen message will be displayed as a thread. When a customer sends a message new message will get displayed on the same channel and an agent can reply on the same thread. To close the chat, click on the “Close Chat“ button. 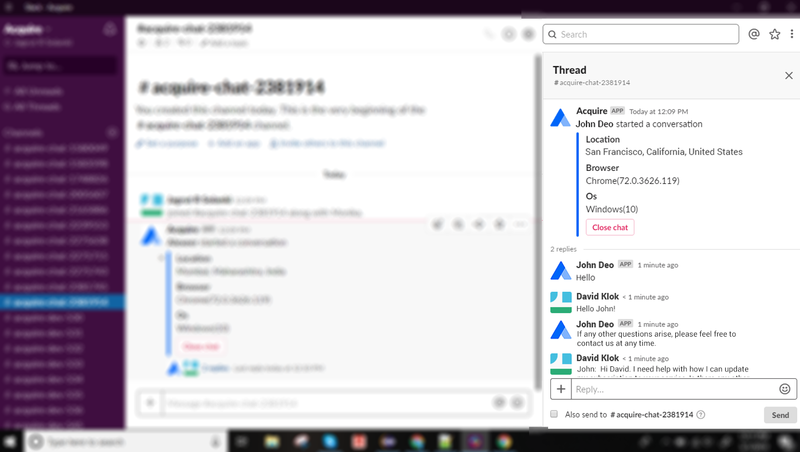 You can also close thread if you didn’t find close chat button during an on-going chat. During a chat or after a chat, when an agent wants to close the current chat, he can use any of the above methods.